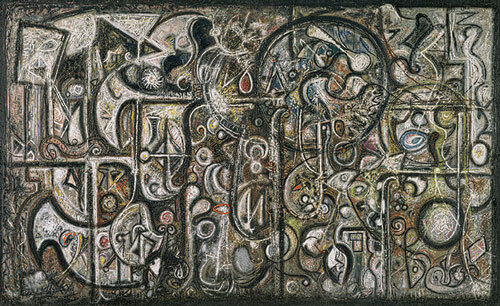 With this work of 1941–42, Pousette-Dart, then twenty-five years old, became the first of the Abstract Expressionists to make a mural-size painting. The monumental, heroic scale is integral to the artist's fundamental goals, expressive of highly personal, mystical beliefs that are as all-encompassing and vast as the work itself seemed at the time. Pousette-Dart worked in several media simultaneously, including painting and photography, and he also wrote a great deal, including poetry, art theory, and a host of other observations. He left more than 200 diaristic notebooks, providing an exceptional snapshot of the world view that shaped his art making. In a notebook probably written in 1940, he wrote, "Art is only significant as it takes us to the whole man and gives us new insights and opens secrets toward the unknown heart of our total mystic awareness." He also wrote, "My definition of religion amounts to art and my definition of art amounts to religion. … Art and religion are the inseparable structure and living adventure of the creative." Like other Abstract Expressionists during the 1940s, Pousette-Dart looked to the art of other cultures for inspiration in seeking meaningful content. African, Pacific, Pre-Columbian, and American Indian art were seen as vehicles to express what Pousette-Dart described as "transcendent"—beyond empirical experience. This densely packed composition is organized around a structured grid that emerges sporadically. 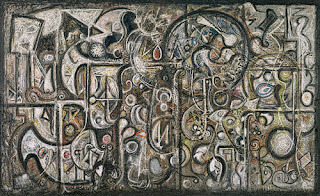 But Pousette-Dart breaks away from a basic Cubist structure to develop a new artistic vocabulary. Circles, teardrops, ovals, arcs, diamonds, and crosses evoke cosmic and organic forms, a rhythmic spread in black, white, and earth tones with points of bright color. Here and there, a nuanced reference to something identifiable emerges: perhaps a bird at the lower left, or some primitive weaponry at the upper left. The paint surface is layered, reworked, evidence of the artist's process of decision making in creating the work of art. The linear grid is apparent and principle elements are all outlined. But the image as a whole seems to pulsate in and out of focus. Pousette-Dart wanted an art that was "mysterious and transcending, yet solid and real."